This USGS Canyonlands Research Station web page provides information about research dedicated to the long-term study of the ecosystems of the Colorado Plateau. The page covers in brief the Physiognomy, Climate, Geology, Soils, Vegetation, Fauna, Elevation Gradients, Land Use, Shifting Climate, Substrates, Invasive plants and research affiliates of the site. 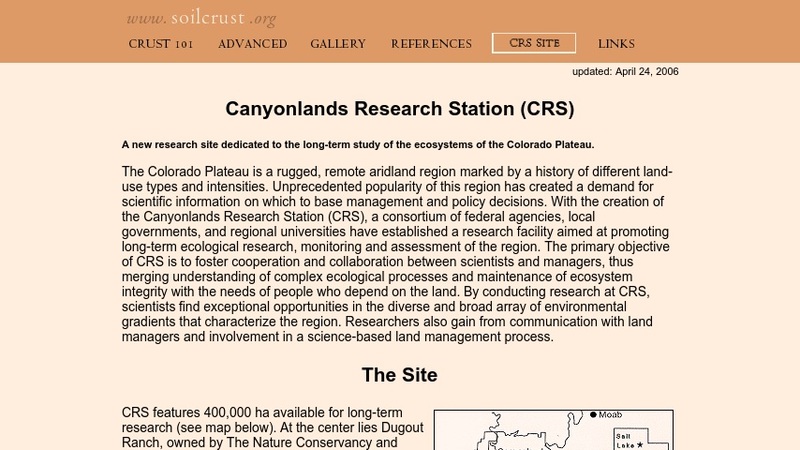 In addition, the site provides links to other Canyonlands Research Station web pages on biological soil crusts including Crusts 101: an introduction to biological soil crusts, an advanced page with a downloadable 90-page report on soil crusts, references, and other related links.